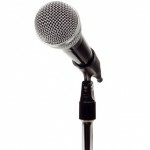 Oral history is in a profound transition, from an extensive period when sophisticated technology meant utilizing tape cassettes, to a time when the field has moved into the digital, networked, multi-media rich age. The transition into a digital world, and the flexibility it brings, has changed the costs of doing oral history, standards of practice and scholarship, and the vehicles for access. Resulting issues are deeply complex and often dynamic. Digital video is now readily affordable, but the field remains deeply divided over its use and role. Equally important, the digital age makes widespread access and use of both audio and video oral narratives, as well as transcripts, increasingly affordable, but it also highlights major questions about intellectual property rights and informed consent. The role of transcription, typically a staple in oral history, is now being reexamined given the new technologies for studying and accessing digital oral histories. Major technical challenges remain, and arise anew, as collections of oral histories are digitized, preserved, and accessed at an extraordinary rate with due consideration to benefits and challenges of the World Wide Web. The ubiquity of the collections creates new challenges for access, searching, archiving and interfaces to online collections. Individual landmark projects that advance oral history by producing new digitized collections bring scholarship and clarity to some issues; however, they also raise new directions and questions that must be vetted and accommodated. Individual practitioners, novices, and grass roots historians of cultural heritage, whose work will only continue to grow as digital technology spreads, need to create their materials mindful of the practices of institutions that will likely be custodians of their work and integrate their histories into media rich exhibits. Overall it is a daunting challenge to reach consensus and clear directions. Museums and libraries are at the forefront of these issues as they are the world’s repositories for cultural heritage, preserving and providing access to past, current, and future oral histories for the peoples of the world. Thus, there is a pressing need to build a sustainable, authoritative and collaborative framework that will put museums, libraries, and oral historians in a position to address collectively issues of video, digitization, preservation, and intellectual property and to provide both a scholarly framework and regularly updated best practices for moving forward. This site is dedicated to taking on this challenge. 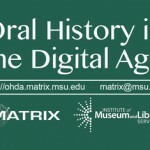 Oral History in the Digital Age (OHDA) is a product of an Institute of Museum and Library Services (IMLS) National Leadership project and a collaboration among the Michigan State University Museum; Michigan State University Digital Humanities Center, Matrix; the American Folklife Center (AFC/LOC), the Library of Congress; the Smithsonian Center for Folklife and Cultural Heritage (CFCH); the American Folklore Society (AFS); the Louie B. Nunn Center for Oral History, University of Kentucky Libraries; and the Oral History Association. For more information on the development and organization of the project, please visit the OHDA Project Site. The project and site was developed under the intellectual leadership of Doug Boyd Director, the Louie B. Nunn Center for Oral History, University of Kentucky Libraries; Steve Cohen, Research Faculty, Michigan State University Digital Humanities Center, Matrix; Brad Rakerd, Professor, Department of Communicative Sciences and Disorders; C. Kurt Dewhurst, Professor, Director of Arts and Cultural Initiatives, and Senior Fellow for University Outreach & Engagement, Michigan State University; and Dean Rehberger, Director, Matrix. If you have comments about the site, questions, or updates, please contact us at matrix@msu.edu (Please include OHDA in subject line) or leave a comment on our contact page.